Millennials are the nation’s most educated generation in history in terms of finishing college. But despite the stereotype that today’s recent college graduates are largely underemployed, the data show that this generation of college grads earns more than ones that came before it. In 2009 (the latest year available) the median monthly earnings of young adults with a bachelor’s degree and no further education was $3,836, a 13% increase from 1984 ($3,399), according to the Census Bureau’s Survey of Income and Program Participation (SIPP). The economic payoffs for obtaining a bachelor’s degree vary widely by major field of study. It is certainly possible that earnings have declined since the early 1980s for specific major fields of study. But given what young adults choose to study, the typical or median young adult with a bachelor’s degree earns more than they used to. The data also show that earnings of young workers with advanced degrees have grown even more than the earnings of those with bachelor’s degrees. 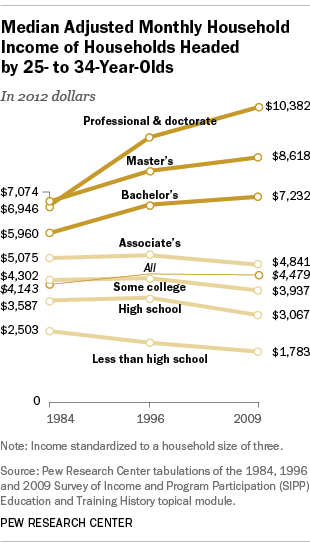 The median monthly earnings of young adults with master’s degrees rose 23% from 1984 ($3,875) to 2009 ($4,772). 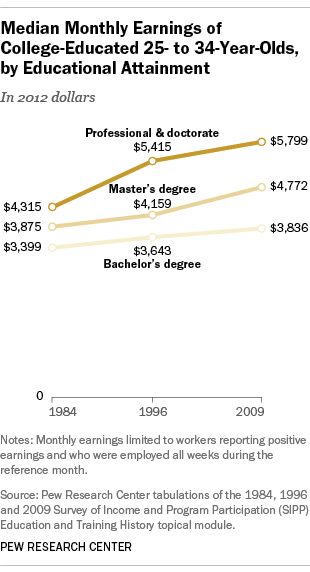 Median earnings for those with professional and doctorate degrees is up even more –34%. Admittedly, the earnings figures above only reflect young adults who can find work. They also do not take into account important demographic changes that have occurred along educational lines. Relative to less-educated young adults, those with a bachelor’s degree have become more likely to be married to someone in their socioeconomic class. And, due to the delay in marriage in this group, there may be delays in having children, which means fewer dependents to support in the household . These are all arguments for looking at another standard measure of economic well-being: household income. The median adjusted monthly household income of households headed by a young adult with a bachelor’s degree has increased by about $1,300 in inflation-adjusted dollars from 1984 ($5,960) to 2009 ($7,232). Household income gains have been even greater among households with advanced degrees (up $1,500 for those headed by a 25- to 34-year-old with a master’s degree and up $3,400 for young adult heads with a professional or doctorate degree). In stark contrast, the household income of young adults with less than a bachelor’s degree has declined in real terms since 1984. These findings do not show that the college education in and of itself caused the gains. All the findings above simply pertain to the economic payoffs associated with a bachelor’s or advanced degree. But students and their families still need to know the typical payoffs associated with educational degrees in order to make informed decisions. One last finding worth pointing out is that college-educated Millennials do not appear to be completing advanced degrees in record number, contrary to the commonly held belief that a weak economy drives more college graduates into graduate school to delay entry into the workforce. In 2009, the most recent data available, 27% of college-educated young adults had gone on to also complete an advanced degree. SIPP data show that’s not statistically different than college grads from 25 years earlier. In 1984, 26% of college-educated Boomers had also finished an advanced degree.